The liner notes for Sigillum Luciferi are emblazoned with the phase “tune down, smoke up,” which really ought to be the motto for any self-respecting stoner/doom/sludge band. 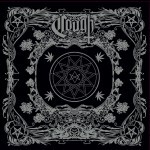 Cough definitely fits that sound to a “t,” and the packaging of the album, adorned with naked chicks, occult symbols, and pot leaves, does as well. 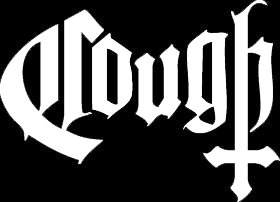 But how does Cough stack up with all the other bands of a similar ilk? I’d place them right at the top of the Sabbath-worshiping heap, along with Electric Wizard and Sleep. Sigillum Luciferi has a sound as dense and psyched-out as Electric Wizard’s magnum opus Dopethrone, but with more feedback and more sinister vocals, while bringing more of a sludge influence to the table (a la Eyehategod) and an all-around ominous, uncomfortable atmosphere. There’s nothing too unique going on here, but the production and riffs more than make up for it. 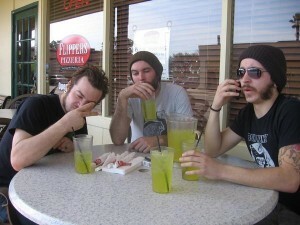 This is one of those examples of stoner/doom being done right. Cough produces a surprisingly dense sound for a trio.The guitar and bass sound on this album is an infinitely meaty slab of square-wave bliss, but not to the extent where chords are indistinguishable from one another; the ultimate sludgy tone has a certain degree of clarity despite all the fuzz. The only album that really rivals this one in its production is the aforementioned Dopethrone. The drums are placed at just the right level in the mix and are just as vital to the wicked grooves as the guitars. The vocals range from Khanate-worthy screams to soaring yelps, bathed in a deep, echoey ambiance. Clocking in at nearly an hour and comprised of only six tracks, Sigillum Luciferi makes use of one of my favorite musical formats: the extended psychedelic jam. There is a bit of repetitous filler, but most of the material is quality handbang-worthy goodness. The standout tracks here are “288 Years of Sin” and “Shallow Grave” because the grooves are simply untouchable. And therein lies a near-perfect synthesis of the warm and fuzzy stoner elements of the doom genre, and the ugly, blackened side of the genre.